Salman Khan's Tiger Zinda Hai gets the second biggest opening of 2017 at Rs 33.75 crore, reports trade analyst Taran Adarsh. "Tiger roars... Flexes its muscles at the box office and takes an extraordinary start," he tweeted. Salman Khan's film opened to packed morning shows and the result is before us. Tiger Zinda Hai's box office success tones down the lamentable performance of his first release of 2017 - Tubelight. Salman Khan, who also topped the list of Forbes' 100 Indian celebrities, has many reasons to celebrate now. 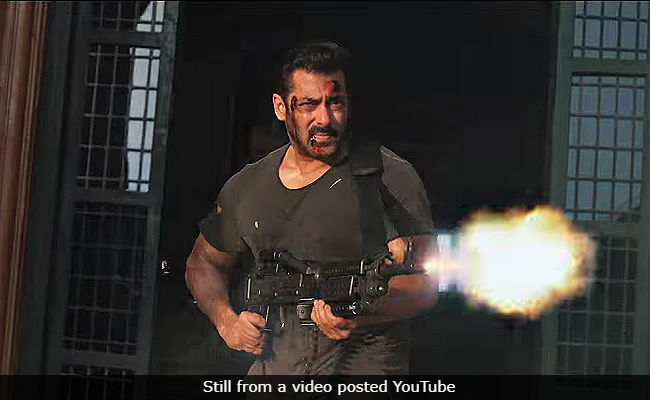 However, Tiger Zinda Hai's opening day collection is significantly lowere than this year's undisputable champion of the box office - Baahubali: The Conclusion, the Hindi dubbed version of which made Rs 44 crore on Day 1. Tiger ROARS... Flexes its muscles at the BO and takes an EXTRAORDINARY start... #TigerZindaHai Fri 33.75 cr. India biz. 4600 screens. AUSTRALIA: Debuts at No 7 position... Fri A$ 203,882 [1.01 cr]. #TigerZindaHai takes a HUMONGOUS START in UAE-GCC... Thu $ 950,000+ [ 6.08 cr]... Since the film is banned in Kuwait, the loss is approx $ 200,000. Even with fabulous ticket window story, Tiger Zinda Hai failed to receive favourable reviews. Film Critic Saibal Chatterjee gave the film 2-star rating and said it lacks logic. "If Tiger Zinda Hai roars loud enough at the box-office, we've got to live with it," he wrote. Film critic Raja Sen had a problem with the film's runtime. "At an exhausting two hours and forty minutes, I really don't care if Tiger is alive or a vegetable - whether he's Zinda or Tinda, really - but this film needed to be much tighter," he said, giving the film 2.5 stars out of five. Tiger Zinda Hai is directed by Ali Abbas Zafar and it also stars Katrina Kaif in lead role opposite Salman Khan.